As an obsessive collector of objects, I’m constantly on the lookout for items with alluring shapes and patterns. In 2014, I found a plate at a dollar shop and was drawn to its thin strips of plastic in a pinwheel design radiating outward from the center. For years it sat in my studio along with a hoard of other objects for potential use and inspiration: vintage glassware from thrift stores, old light fixtures from architectural salvage shops, junk-food canisters, and take-out containers from local restaurants. I loved the plate, but struggled to incorporate it into my ceramic work. Instead of recreating it, I challenged myself to transfer its pattern into a different three-dimensional shape. Since then, I have developed a slip-casting process that allows me to superimpose patterns over textures using plaster molds and colored casting slip. With this process, I can collage the surface imagery of multiple objects into a singular form, mixing and matching colors and patterns to create unique pieces out of the same mold. To make a flare vase, I need one mold for the vase form and several pattern molds. I keep approximately 40–50 pattern molds in my studio so I always have a wide selection. It’s easiest to work with molds taken from flat objects, like a plate, but the transfer process also works with rounded objects. Before casting, wipe each of your mold parts with a damp sponge to remove any dust or leftover clay particles (1). For my casting slip, I use Laguna cone-6 porcelain casting slip and add Mason stains in a variety of hues. I typically keep 15 slip colors mixed and ready for casting. The most intensely saturated colors have 7 grams of dry stain per 100 grams of wet slip, while the lighter colors have as little as 0.25 grams of stain per 100 grams of slip. To make colored casting slip, first measure out the slip and stain separately, then add enough water to the stain to make a slurry, stir it into the slip, mix well, and sieve to remove any clumps. Post-firing, the colored porcelain looks much more vibrant than when in liquid form, so I have samples of each fired color to aid in my selection of a piece’s color palette (2). For this particular vase, I’m using dark gray as the main exterior color, with a white interior and patterns in turquoise, red, and light blue. When selecting colors, I try to maintain a joyful balance between softer, more neutral colors (usually gray, white, or light blue) and bright pops of more deeply saturated colors. 1 Cast a flare-shaped vase using one six-part vase mold and several pattern molds. 2 Select the vase’s color palette: fired color samples and colored porcelain casting slip in dark gray, turquoise, red, and light blue. 3 Brush red slip into the texture in the sunburst-pattern mold. 4 Wipe away excess slip. The slip will stay in the recessed areas of the pattern mold. Begin by casting the individual patterns, which will later be transferred into the vase mold. Brush a thick layer of colored casting slip over the sunburst pattern mold (or a textured mold with deep recesses) (3), then allow the slip to dry until it has lost its sheen (about two minutes). Using clean water, sponge the interior surface of the mold. The colored casting slip will remain in the recessed areas, leaving the raised plaster areas bare (4). Once you’ve removed colored slip from any unwanted areas of the pattern, cast the mold with the main exterior color; for this vase, I’m using dark gray (5). This will allow the sunburst pattern to blend into the background of the vase without a harsh seam line. Cast only until the slip is paper-thin (about three minutes), then drain and let the mold dry on its side to prevent pooling (6). Repeat steps 3–6 with the remaining pattern molds. To make a polka dot or a solid circle of color, cast a pattern with only the accent color. After the cast pieces have firmed to leather hard, they’re ready to be removed from the molds. 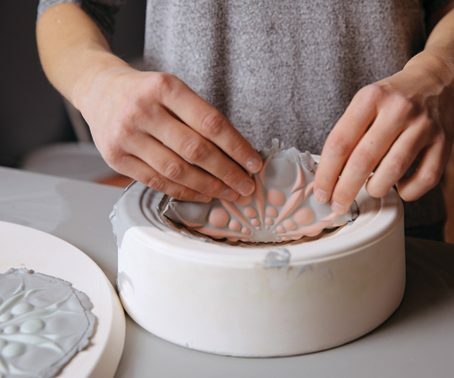 Using your fingers and a flexible rubber rib, slowly begin peeling the clay out of the mold, releasing the edges first and working toward the center (7). At this point, the clay can easily rip or tear, so work carefully. Once removed, lay the clay pieces flat on a plaster slab (8). Using cookie cutters, trim the patterns into tidy circles (9). 5 Cast the sunburst pattern in the slip that will be used to cast the body of the vase. 6 Drain molds after 3 minutes and allow them to dry on their sides. 7 Peel clay out of the mold. Release the edges first and work toward the center. 8 Lay the finished cast pattern on a plaster slab to firm up. The cast patterns are now ready to be attached to the interior of the vase mold. Map out where you want each of the patterned pieces to go on the form. For this vase, the two sunburst patterns are placed into the top half, and the textured polka dots are attached into the bottom half. 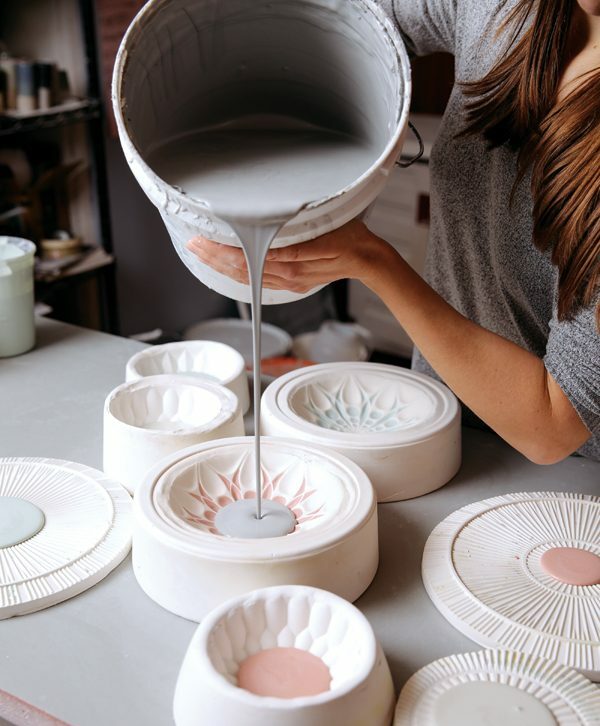 Spray the mold with water in the spot where you want to attach the pattern—the clay will adhere best to the mold if the plaster is wet. Using a damp sponge, press the clay into the mold. Wet your fingers and continue pressing the clay into the plaster to make sure it’s firmly attached (10). As a final step, brush casting slip around the edges of the piece, using the main exterior color of the vase (11). This creates a seal, helping the patterned piece stick to the mold surface, and also prevents any excess slip from leaking in when casting the mold. While the seam lines may look messy at this stage, the brushstrokes will not be visible after the piece is cast. Repeat for all patterned pieces. 9 Use a cookie cutter to cut the patterned pieces into circles. 10 Press the pieces into the vase mold with a damp sponge and your fingers. 11 Brush the primary casting slip around the edges of each piece to create a seal. 12 Once the patterned pieces are secure, assemble the mold and strap it together. Assemble the mold pieces (12, see 13), then strap them together. To cast a gray exterior and a white interior, first fill the mold with gray slip (13), cast for five minutes, then drain it. As soon as the gray clay is no longer wet to the touch, cast the mold in white slip. The white casting slip must be the same clay body as the colored slips. Drain the mold after the desired thickness is achieved (typically 20–30 minutes, depending on slip consistency). After two hours, the vase will shrink and detach from the mold. Carefully disassemble the mold pieces (14). There may be surface cracks on the patterned areas, especially if the vase mold is deeply textured; these cracks can easily be compressed at the leather-hard stage using your finger and a bit of water (15). I allow the piece to dry completely to bone dry, then sand the surface using a wet green kitchen scrubby and a damp sponge to remove unwanted seam lines and smooth out sharp edges. Bisque fire the piece to cone 06. 13 Fill with dark gray casting slip, drain, then fill with white slip to develop thickness. 14 Disassemble the mold to reveal the dark gray exterior and white interior. 15 When the clay is leather hard, compress any cracks in the patterns. 16 Apply a glaze over the texture, then use a sponge to remove it from the raised areas. Next, wet-sand the entire piece using 320-grit sandpaper to ensure a soft, smooth surface that’s pleasant to touch. After allowing the piece to dry for 24 hours, glaze the interior first. I use a glossy base glaze and add Mason stains in a variety of hues to complement my colored porcelain palette. Allow the piece to dry completely before glazing the exterior. I inlay glaze into the vase’s bottom half to activate the texture, contrasting the glossy glazed areas with the soft, matte surface of the colored porcelain. Dip the entire bottom half in opaque white glaze, then let it dry for at least 12 hours so there’s no water saturating the piece. Next, wipe the surface clean with a damp sponge, leaving the glaze in the recessed areas and exposing the colored porcelain in the raised areas (16). Fire the piece to cone 6 in an electric kiln (17). After the piece has cooled for at least 24 hours, do a final wet-sanding with 400-grit sandpaper to polish the unglazed areas. 17 Fired flare vase showing contrasting textured and colored slip-cast areas. Kelly Justice currently works as the ceramic studio manager at the Flower City Arts Center in Rochester, New York, where she maintains an active studio practice. She received her MFA in ceramics in 2015 from the New York State College of Ceramics at Alfred University. To see more of her work, visit www.kellyjustice.com. Add:, balance, base, bisque, bisque fire, body, bone dry, brush, cast, casting slip, ceramic, ceramic studio, ceramic work, ceramics, clay, clay body, collector, color, colored, colored slip, colors, cone 06, cone 6, cone 6 porcelain, consistency, design, dry, edges, electric kiln, firing, flower, form, gallery, glaze, glazing, handbuilding, imagery, inlaying, inspiration, kiln, kitchen, leather hard, mason stains, mfa in ceramics, mixing, mold, molds, neutral, palette, paper, pattern, patterns, plaster, plaster molds, porcelain, process, rib, sand, sanding, shape, sieve, size, slab, slip, slip cast, slip casting, slip casting process, sponge, stain, stains, studio, surface, techniques, texture, thickness, transfer, vase, vintage, visit, water.